I’ve never professed to being a SketchUp ‘expert’. I’m far from it (but my mate, Dave is. He’s freakin awesome. Hi Dave! Check out some of his awesomeness here). But I’m definitely not a ‘beginner’, so I guess I’m at an ‘intermediate’ level. Once you start using SketchUp, you will wonder how you ever coped without it. There’s a simple explanation for this. SketchUp is basically the BFF you could only ever dream of. He (yes, I’ve decided that he’s a ‘he’, don’t ask), is unique when it comes to 3D modeling applications. He’s uncomplicated, easy on the eye and always strives to deliver. And his objective is clear: he wants to make the whole process of 3D modeling as simple and accessible as possible. He sounds kinda dreamy, right? 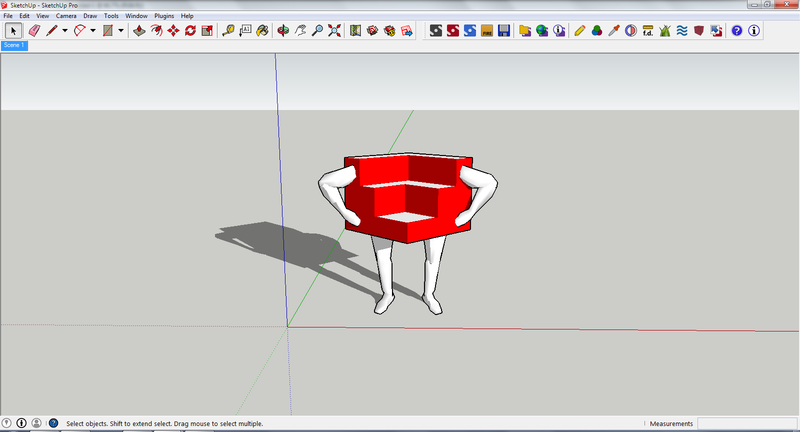 If SketchUp was an actual character (humor me), he would probably look like this. Look at him, standing all proud at his axis, ready and waiting for your command! Here’s ‘Sketchy’, your loyal and trusted 3D companion. Don’t be shy, say hello! At this stage, you’re probably thinking 1 of 2 things: this girl needs urgent medical attention, OR awh, I always thought SketchUp would look like that!! If you’ve opted for the latter, then you’ve clearly got the SketchUp bug. My love affair with SketchUp started approx. 3 years ago when I decided to explore 3D modeling software applications to support my interior design studies. After a little bit of ‘Googling’, I quickly stumbled upon something called SketchUp. After realising that it was FREE, I downloaded it. No one saw or heard from me for an entire weekend. I couldn’t believe how intuitive and user-friendly it was. It is possible to produce tangible results with this 3D modeling tool, with very little knowledge and experience of its interface, at an unbelievably fast rate. If you don’t believe me, I suggest that you download it and try it for yourself. I’ve kept the first 3D model I ever created using SketchUp. It’s rife with amateurish errors and technical mishaps (I wince loudly when I look at it) but it’s an important 3D model: it signaled the start of a new chapter in my life and a whole new world of opportunities (3D Visualisation). I was so tempted to make a few minor improvements before I posted this image but that would be morally wrong. So here’s my first ever 3D model in all its (flawed) glory. The point I’m trying to make is that I created this with very little experience of SketchUp. This is virtually impossible with most of the competing CAD applications on the market. 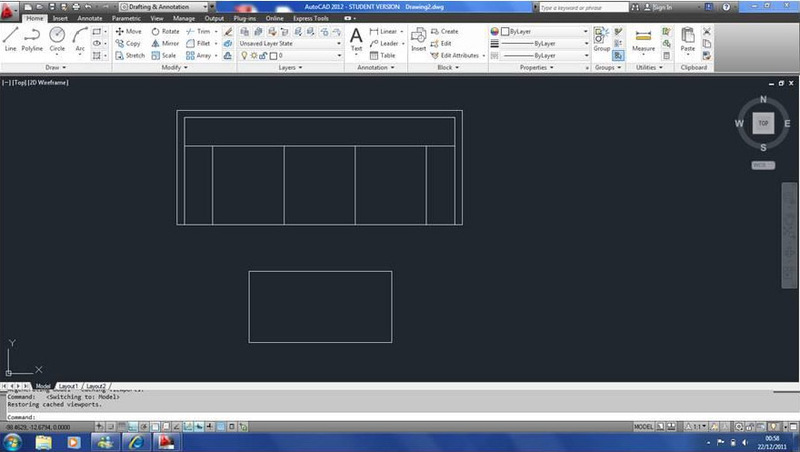 For example, when I started self-teaching AutoCAD, it took me an entire weekend to draw a few squares. Self-teaching AutoCAD was a very different experience to learning SketchUp. With AutoCAD, I wanted to put my laptop in a headlock, whereas learning SketchUp made me want to throw a party in its honour. And that’s where SketchUp is unique. It’s simplistic in layout and design. And it eases you gently into the world of 3D modeling with its huge library of ready-made components in the form of the 3D Warehouse (all uploaded by fellow SketchUp users). And let’s not forget about the SketchUp Basecamp events that are held every year (which I can never flippin’ attend because of where I live..BOOOO!). It would appear that SketchUp, as a brand is very visible to its users and provides a fantastic support network too. My fondness for this CAD software is so strong, that I was ecstatic when SketchUp started following me on Twitter. Let’s put this into perspective: Tom Cruise follows me on Twitter too. But I don’t check on a monthly basis, to see if he is still following me. Yea, you’re right. I really do need to get out more.